Barrier provides three levels of equipment tracking. Barrier provides three levels of equipment tracking that can be customized to your process and requirements. Apex is a wireless monitoring device that sends data right to your smart device. It is a maintenance tool to check your vibratory equipment vitals on the move. 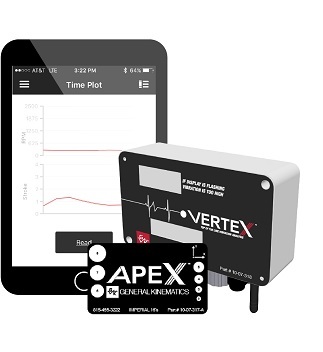 Vertex monitors and records vibratory data and will even send alerts to your phone and email if there is an issue. Users can access vibratory equipment data history through the Barrier portal or USB key. It allows the opportunity to provide a maintenance team the data it needs to make informed decisions on part replacement, and avoid unplanned downtime. With Nomadx, a team of vibratory experts provides advice and analysis of equipment data when it’s needed. Barrier was made with predictive maintenance in mind.